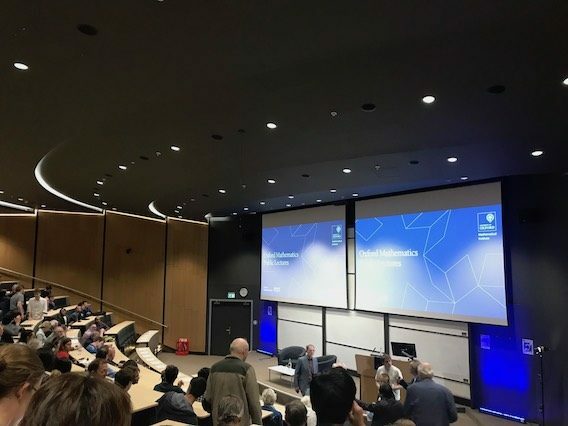 The week before exams started in May, EF Academy Oxford organized a trip to the Mathematical Institute at the University of Oxford in order to take part in a lecture about how it’s possible to have fun with math. Sir Michael Francis Atiyah, one of the most brilliant mathematicians of the last century led the lecture titled Numbers are Serious but they are also Fun. We learned about Sir Atiyah’s life as a mathematician. While not a technical speech, he tried to motivate and fascinate the audience with the beauty of math. It gave us a greater insight into his lecture. Amongst the many examples, he brought out one of the most illuminating – Euler’s formula. What’s interesting here is that all the most critical numbers/constants are contained together and the main takeaway was that Euler must have had fun writing it. This was the point that stayed with me, as he used a powerful and unusual adjective for the context: FUN! We also found motivation in funny moments like his informal definition of the constant e (Napier’s constant) as “the amount of interest you receive from a very friendly bank”. He lingered over the concept of looking at mathematical research in a new light. Not as a tedious job or a repetitive task, but as a mind-stimulating way of discovering the world around us with the beauty of Mathematics. I believe that everybody was inspired by this idea and others like it. After a thirty minute talk, the questions-based part began. Sir John Ball, professor of Natural Philosophy at the University of Oxford, interviewed him. Asking questions to shed some light on what had influenced the mathematician in his life and in relationships, lifestyle, as well as original concepts and how those came into his mind. He is a man of great depth in terms of knowledge, but he always talked about himself as an ordinary person with friends, hobbies, a family, and a regular life. He underlined the importance that his wife, Lily Brown, had in his life. She was also an eminent mathematician and Maths professor and impacted him both from a technical perspective and a human perspective. He said she was the one who gave him motivation when he was down and backed him up when he wasn’t sure what to do.